Dare To Play Crusade of Fortune Online For Free! 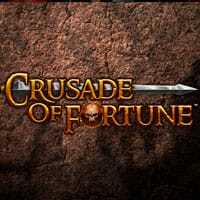 Get A Ton of Excitement Playing Crusade of Fortune For Free! Fantasy funs, rejoice! Here comes the game that you simply cannot afford yourself to pass by – Crusade of Fortune slot machine! Are you ready to dive into the dark, medieval-looking fantasy atmosphere? One –two – three, GO! It is a 5-reel, 20-payline game, which was created by Net Entertainment, so it has what to offer. Indeed, it’s a fabulous 3D video slot, which has the power to keep you entertained for long. As it loads, you’ll highly value its decent graphics, stunning sounds, and an amazing fantasy/adventure theme. While playing, you will come across a number of mysterious creations, including dwarves, witches and warlocks, and Minotaur. You’ll also adore the fact that there’s a little animation involved when you get a winning combination. When it comes to bonuses, you’ll see scatters, wilds, and bonus icons. By the way, the dwarf symbol acts as a scatter here whilst the wild icon is represented with the purple-skinned elf symbol. Get at least five purple-skinned elves on the reels, and you’ll be rewarded with a 5000-coin jackpot. The betting options are varying, but to better understand the game and its rules, play it for free at Slots Online Free! No need to register or download special software to play Crusade of Fortune slots game. Enjoy!